Today there are four ranges of diesels being produced at Mirrlees. these are the long established E Mk II, K Major, the MB275, and the MB430. This engine is a development of the original E series which had a service life of some 30 years. Introduced in 1977, the E mkII first appeared as an in-line unit and was equally popular in power generation and marine applications, power output was from 800 to 2000 horsepower. A logical extension of this well established and successful model was the introduction of 12 & 16 cylinder vee form units in 1986. This increased the power range to 4,000 horsepower. these engines have provided reliable power for many remote Island communities and given good service in marine applications. Introduced in 1966, the k Major has a reputation for reliability accompanied by economy. Designed for economical performance on low grade residual fuels, it also has the ability for dual fuel operation. It is primarily for use for base load power generation, marine propulsion and auxiliary duties. It is available with power outputs ranging from 1,500 to 13,140 horsepower. Since it's introduction, more than 1,000 engines havebenn built with a combined output in excess of 5 million horsepower. The longest running of these is a KV16 at Marcopper Mining Corporation with over 135,000 hours of running time on residual fuel. The CEGB have chosen the K Major as their number one standby power generating set for nuclear power stations in the British Isles. this is a lower powered unit of underslung crankshaft deisgn with powers ranging from 1,700 to 6,100 horsepower at speeds ranging from 720 to 1,000 r.p.m. It is for use as base load or standby power generation, marine propulsion and auxiliary duty and more recently for rail traction. In 1985, the 6 cylinder MB275 successfully completed the British Rail Type Test, and in 1987 the 8 cylinder MB275 was also successful in completing this rigorous test. In June, 1988 British Rail placed an order for 100 MB275 eight cylinder units for their Type 60 locos. This is the largest and most powerful engine ever produced by Mirrlees, developing a nominal 1,000 horsepower per cylinder. Also of underslung crankshaft design, the MB430 has considerable development potential. 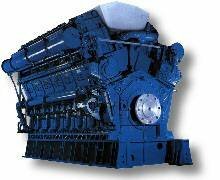 Designed for economical and reliable operation on heavy fuels, it isavailable in a power range from 6,000 to 17,6000 horsepower at 600 r.p.m. It can be used for base load generation or marine propulsion.